JEAREY MENS BLAZER - Idea gift for Labor Day, Prime Deal Day, Thanksgiving and Christmas. US Size XS=Tag size(Asian size) L : Shoulder :16.93"--Chest:37.80"--Seleeve lenght:24.41"--Lenght:27.56"
US Size S=Tag size(Asian size) XL : Shoulder :17.32"--Chest:39.37"--Seleeve lenght:24.8"--Lenght:28.35"
US Size M=Tag size(Asian size) 2XL : Shoulder :18.11"--Chest:41.73"--Seleeve lenght:25.20"--Lenght:28.74"
US Size L=Tag size(Asian size) 3XL : Shoulder :18.90"--Chest:44.09"--Seleeve lenght:25.98"--Lenght:29.13"
US Size XL=Tag size(Asian size) 4XL : Shoulder :19.69"--Chest:45.67"--Seleeve lenght:25.98"--Lenght:29.13"
US Size 2XL=Tag size(Asian size) 5XL : Shoulder :20.47"--Chest:47.24"--Seleeve lenght:26.38"--Lenght:29.92"
please reference the size chart images(Not the Amazon Size Chart)or inquiry to customer service before order, we will give you advice on the size. *Please be aware that colors might look slightly different in person due to camera quality and monitor settings. 【MATERIAL】- Cotton polyester blended, which is comfortable, breathable, softer, smoother and easy to keep the shape. 【DESIGN】- Casual suit blazer is slim fit cut with 3D draping. One button, single breasted, notch lapel, featuring 2 flap pockets and 2 Inner pockets. 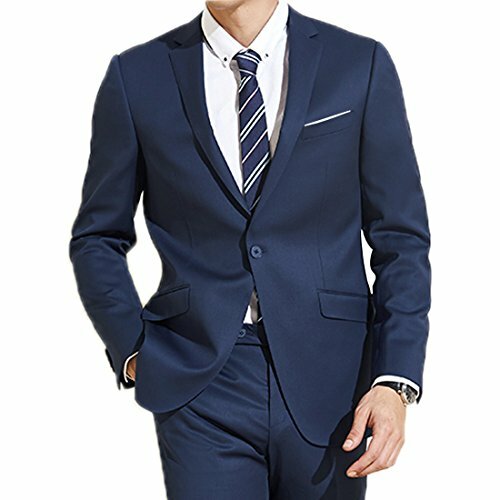 【OCCASION】- Solid suit jacket is perfect for daily casual wear, business meeting, dates, wedding, graduation party, prom and etc. Idea gift for Labor Day, Prime Deal Day, Thanksgiving and Christmas. 【WASHING】- Dry clean recommended, machine wash cold separately, low Iron. 【SIZE】- Items are slightly smaller than expected. Please refer to our size suggestion picture below carefully(Not the Amazon Size Chart). If you have any questions about size,please feel free to contact us. If you have any questions about this product by Jearey, contact us by completing and submitting the form below. If you are looking for a specif part number, please include it with your message.